Each Wave Glider has an instrument package that floats on the surface and a flat wing-like structure that hangs below it. As the glider is raised and lowered in the waves, the wing transfers the motion forward. Credit: Image Courtesy of Liquid Robotics Inc. Hundreds of miles off the California coast, four drones about the size of surfboards and are tossing across the Pacific toward Hawaii, controlled by pilots on shore. Called Wave Gliders, these seagoing drones fly orange warning flags -- they're not spying, won't destroy anything and certainly won't kill anyone. 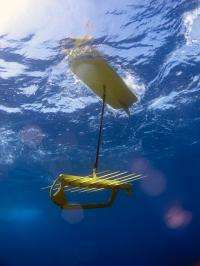 These gliders are an oceanographer's dream, providing scientific data on the surface of the ocean for posting on the Internet for scientists to analyze for free. Eventually, the four drones -- named Papa Mau, Benjamin, Fontaine Maru and Piccard Maru -- will wind up in the Guinness Book of Records for the longest sea voyage by unmanned vehicles. "Everything is working well," said Roger Hine, founder and chief technical officer of Liquid Robotics, the company that built the Wave Gliders. "The area being sampled has never been sampled before." After having the instruments calibrated in Monterey Bay, which is well-monitored, the gliders were sent into the ocean from San Francisco's St. Francis Yacht Club last Nov. 17. The drones, now separated by 40-50 miles, will split near Hawaii. Two will head for Sydney, Australia, and two will traverse the Mariana Trench -- the deepest part of the ocean -- heading for Tokyo. When they are done, they will have completed 34,000 combined nautical miles, collected approximately 2.25 million data points and been at sea for almost a year. The drones are measuring salt content, water temperature, wave motion, weather, dissolved oxygen, and fluorescence, the property that makes something release light in response to incoming light or other electromagnetic radiation. Hine began the project in 2005 in order to help a friend monitor the sounds made by humpback whales. It occurred to him a robotic device carrying instrumentation would do the job. He formed Liquid Robotics, a company in Sunnyvale, Calif., to build the drones. James Gosling, designer of the computer program Java, is chief software architect, and Edward Lu, a former astronaut, is in charge of technological applications. "Wave Glider is a wandering robot that can carry any instruments you want," Gosling said. It can also work in storms that would send a conventional vessel fleeing. The four in the Pacific are among 70 Liquid Robotics has built since 2009. Financed by private funding and venture capital, the company has sold several to the National Oceanic and Atmospheric Administration for $100,000 each. The company also sells data services to private firms, including BP. They sent one glider across the Gulf of Mexico after the 2010 oil spill. Each glider, including the four on the Pacific expedition, has an instrument package that floats on the surface and a flat wing-like structure that hangs below it. As the glider is raised and lowered in the waves, the wing transfers the motion forward. Instruments on the surface are all solar powered, making the glider entirely self-contained. The pilots can send a command every five minutes, Hine said, turning equipment on and off to save energy, changing what they sample or to change course. All the data is put on the Web, either on Liquid Robotics' website or on the places layer of Google Earth. The data will be invaluable to oceanographers and climatologists. "We are under-sampled all over the ocean," said Francisco Chavez, senior scientist at the Monterey Bay Aquarium Research Institute, who does not work for the company. "Because of how expensive ships are, we are not getting the information we need to see how the world is changing. The Wave Gliders help us do that." It differs from other seagoing drones in that it can carry more payload, Chavez said. It can communicate with other devices, and can even relay data from submersible vehicles, although that won't be a function on this expedition. They are also faster. Conventional sea drones travel at a bit over 0.5 mph, while Wave Gliders can go about 2.3 mph in good seas. The data is restricted to the surface. Other drones go into depths, he said. According to Hine, the gliders are particularly good at measuring currents, already helping to change sea current maps in the short time the drones have been at sea. The Wave Gliders can also help to solve some current riddles. "They can improve forecasting and our knowledge of ocean structures out there," Hine said. Chavez said that the gliders give more precise information and could be useful, for instance, in providing current data to tankers crossing the ocean. Can it be used to keep ships from running aground due to incompetent ship's capatains?